It's Friday again! Which means I'm back with another Cocktail from the Garden and this time the star of the herb show is Pineapple Sage. Pineapple sage is a new addition to my herb garden, but one that I am eager to watch flourish. Not only do the lovely green leaves truly taste like pineapple, but the flowers that this perennial produces will attract hummingbirds, bees and butterflies. I also intend to steep the leaves for a pineapple-y ice tea this summer. That being said, I infused vodka with pineapple 2 weeks ago so that it was delightfully fruity and sunny when I wanted to make this cocktail. But lest you fear that this Pineapple-Sage Mojito is just a grown-up glass of pineapple juice, au contraire. The pineapple is there, but not overwhelming and the lime provides a delightful balance. This couldn't get much simpler; using a 1:1 ratio pour vodka over pieces of pineapple (cubes, chunks, slices, etc…) in a jar and let steep in your refrigerator for at least 10 days…the longer the better. Since I will only be using a little at a time, I'm inclined to try to top off the bottle with new vodka when I put it back in the fridge! Tip: Frozen pineapple works perfectly! Roll your lime(s) on your counter to soften them and release their juices. Place lime wedges, simple syrup and pineapple sage leaves in your glass and gently, but firmly muddle with a muddler. Don't overmuddle! Your goal is not to shred the herb leaves, but rather to just press out the oils from the leaves and the juice from the fruit. When you shred the leaves you release the bitter chlorophyll in the leaves' veins. If your freezer doesn't make crushed ice, wrap some ice cubes in a dishtowel and bang it on your counter…or hit the pouch of ice cubes with rolling pin! If you make this recipe and love it, it'd be fantastic if you came back and rated it! Muddling pineapple sage with fresh limes is just the beginning of this perfect spring and summer cocktail. 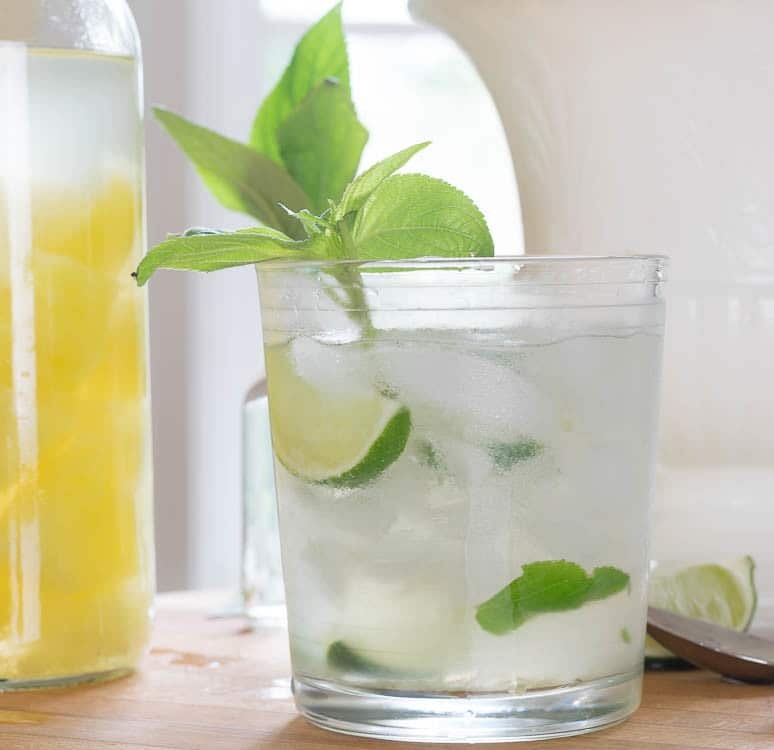 Pineapple-infused vodka, an essential part of this Pineapple Sage Mojito recipe, is so incredibly easy to make...just plan ahead. Using muddler, muddle the lime, simple syrup and pineapple sage leaves. With a gentle but firm force, push the muddler down into the lime and leaves and twist. Repeat 6-8 times. Don't muddle too much or you will release a bitter taste from the lime pith and the leaves. Stir gently to incorporate all ingredients. Store in the refrigerator for at least 10 days prior to use. The longer the better! 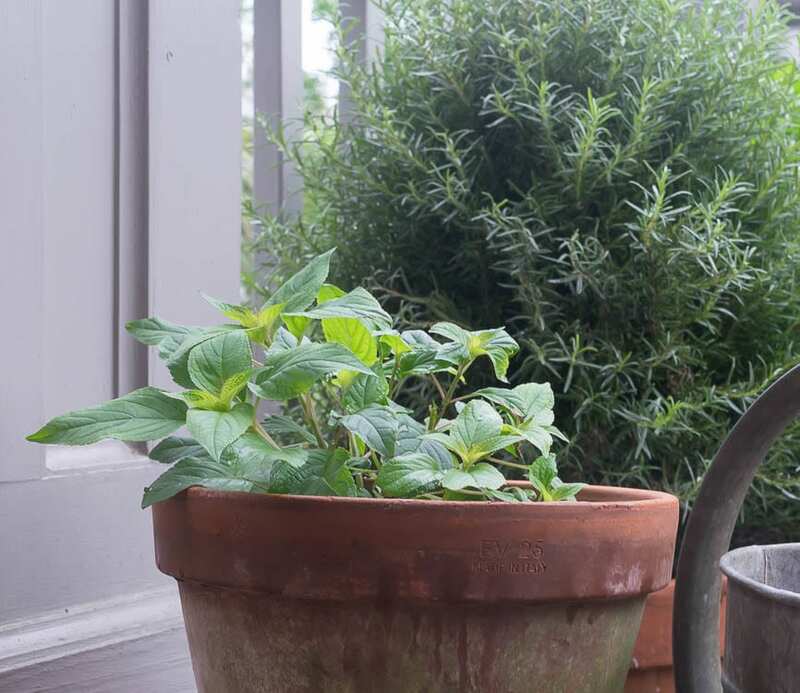 If you want a Pineapple Sage Mojito to work its way into your cocktail repertoire, then bookmark this page or pin the following image. What are pineapple sage leaves? Where would I find these? I found my little pineapple sage plant at Home Depot.. can’t wait for it to get a little bigger and produce those lovely red flowers! It’s a perennial in some zones and the leaves truly smell and taste like pineapple! Thanks for asking and have a great day my friend.